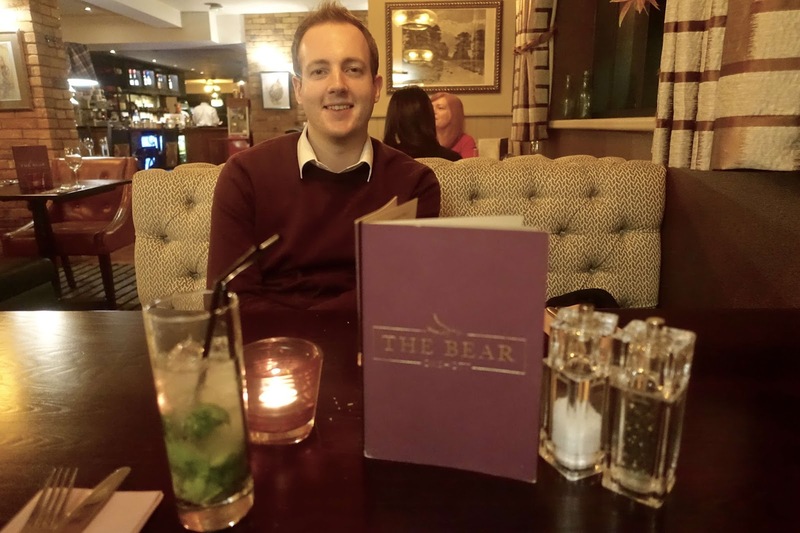 Recently I was invited down to a pub called The Bear which resides in a rather affluent area of Surrey in Oxshott. 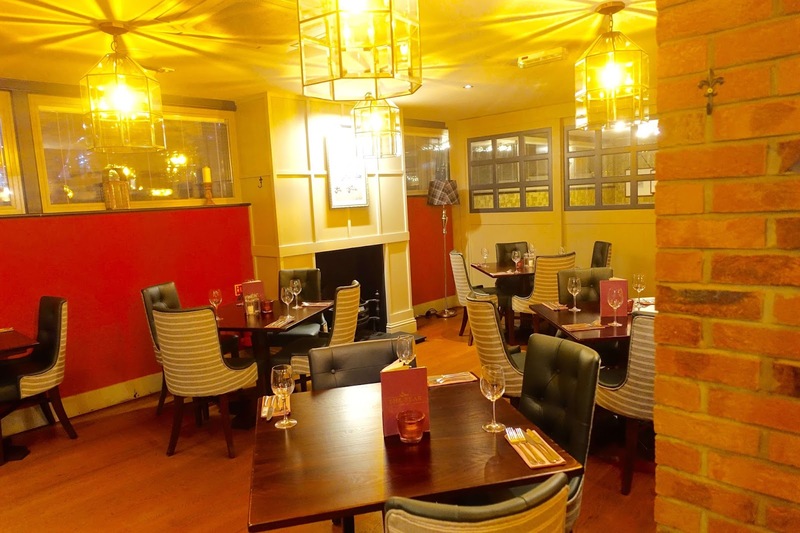 In November the pub relaunched as a trendy gastro venue after a huge renovation and extension project and I was excited to visit the pub and experience its new-look. 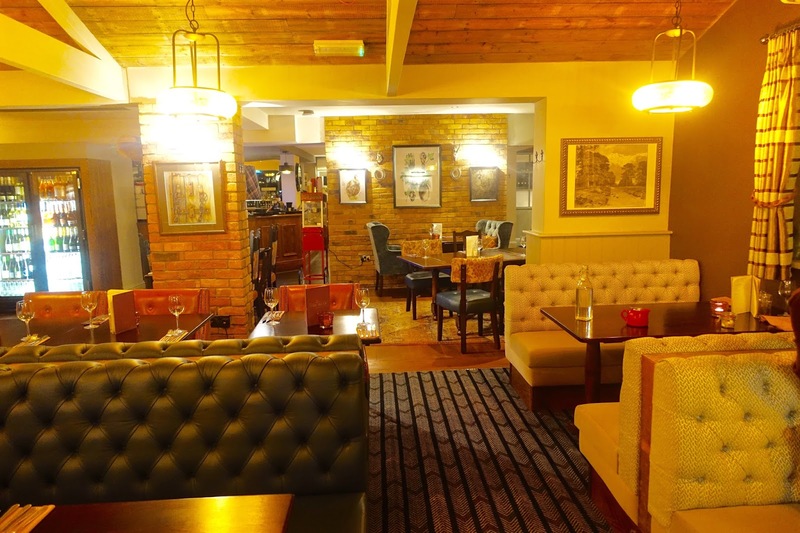 The pub features classically designed interiors with rich fabrics and finishes throughout, there are plenty of cosy seating areas nestled around the bar itself, as well as a private dining area and plenty of tables with trendy mismatched seating for dining throughout. There is also a decent outdoor dining space which would be ideal for the warmer, summer months with a glass of fizz or refreshing mojito in hand. 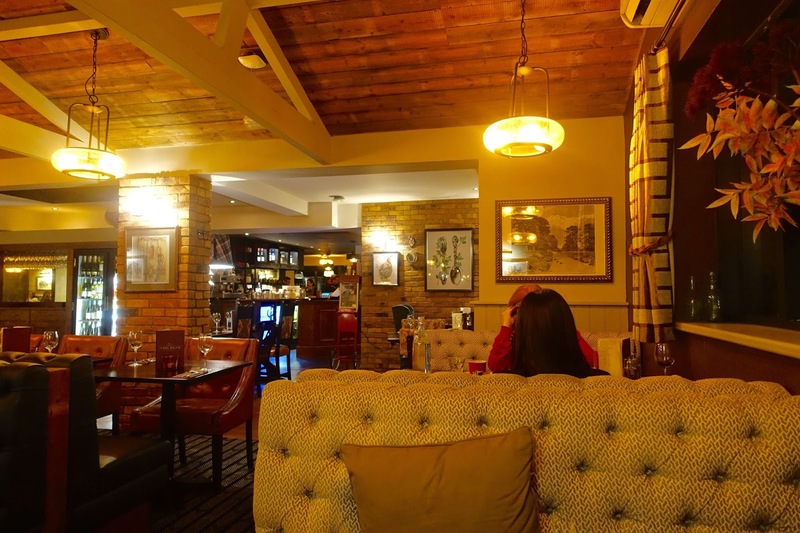 On arrival, you immediately enter into the bar which is decorated with wood and is surrounded by sunken Chesterfield sofas and blazing log fireplaces. 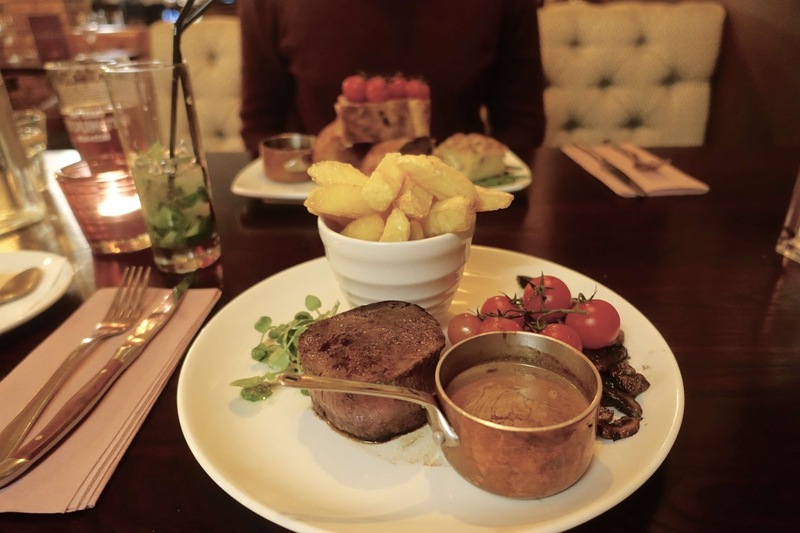 Food is fresh, seasonal and British, on the menu you'll find classic dishes like the Bear's beef burger and beer battered cod, along with more contemporary items like our delicious starter; crispy pork fritters with a homemade chili jam (£5) as well as an extensive wine list to suit all tastes. I'm always pleased to visit a trendy pub with a small but selective cocktail menu on offer too. We were seated in a cosy booth by the window complete with fabric patterned seats. After a long day at work and a short drive over to Oxshott (about 40 minutes from West Sussex), I was in need of a refreshing cocktail - a mojito was just what the week ahead ordered. We quickly settled upon sharing the Crispy Pork Fritters with Homemade Chili Jam (£5) as a nibble before setting our sights onto mains. 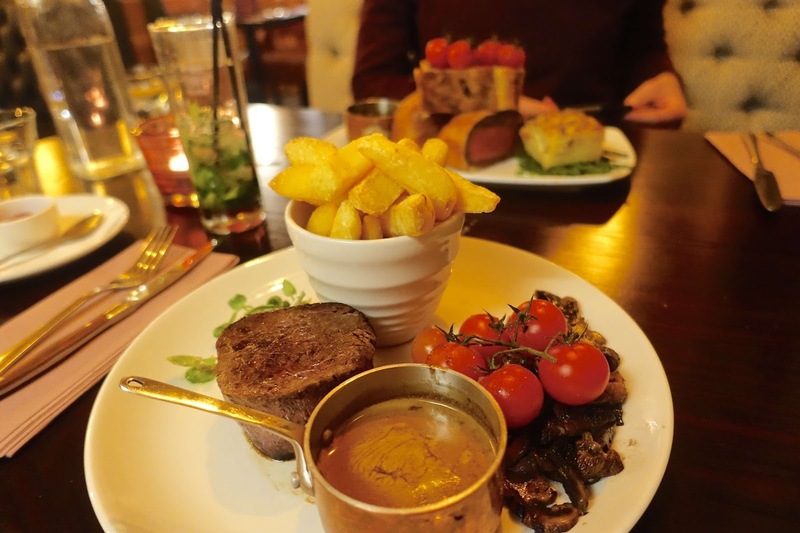 A steak lover through and through, I ordered the 8oz Aberdeen Angus Fillet steak, served with triple cooked chips, roasted vine on tomatoes and a Portabello Mushroom (£30). My lean cut of beef was juicy and lean and I ordered with a creamy peppercorn sauce for £1.50 extra. The triple cooked chips were fluffy and melted in the mouth. 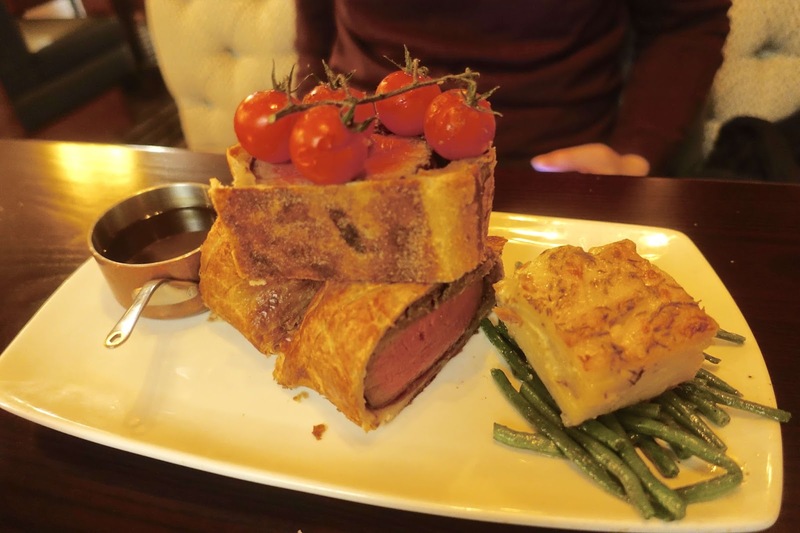 Alex opted for the Beef Wellington for one special (£28) which also came as a sharing option for two at £50. 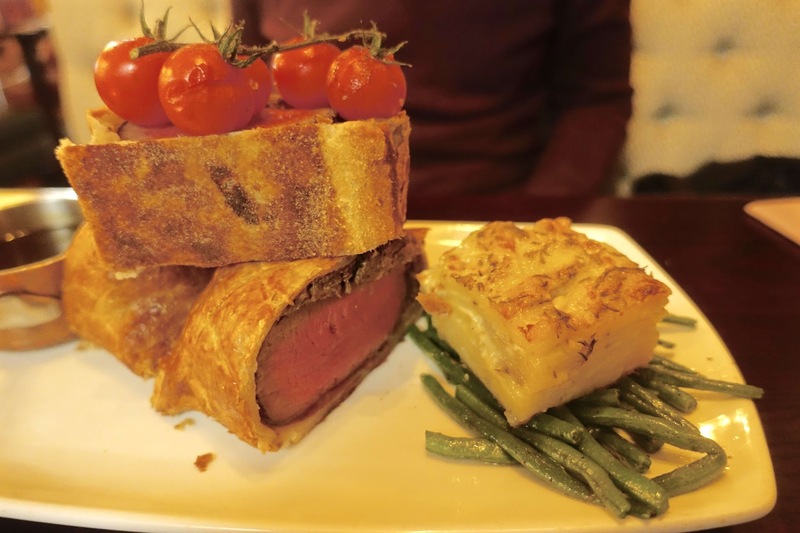 When the Beef Wellington for "one" arrived we were both surprised at how large the wellington portion for one was. I can't imagine what the sharing portion for two would have looked like! Alex received three large cuts on his plate, which were HUGE (as you can see from the photos). Unfortunately, Alex really struggled to get through the whole thing and he mentioned that the portion was too big (that's rich coming from someone who eats a hell of a lot) so he was unable to enjoy the dish to its full capacity. The staff at the Bear did mention that it was the first time the dish had been offered as a special and the portion size was likely to be reduced as they had quite a few people returning the dish unfinished. Although credits to the chef for his generous portion sizes! The food was very enjoyable and we'd love to go back and try one of the sharing boards in the sunshine. 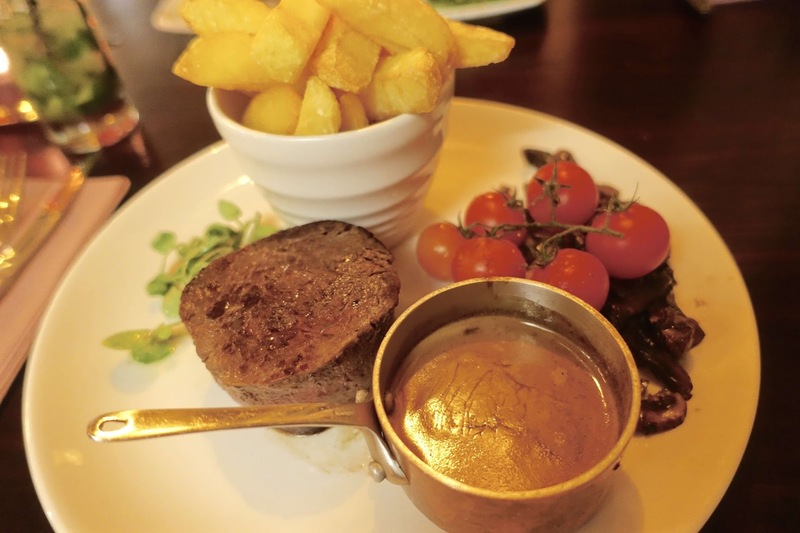 For Surrey scotch egg fanatics - see my review of The Stag on the River in Goldaming.